The University of Notre Dame Institute for Global Investing, as part of its Women in Finance Initiative, is partnering with the educational nonprofit Girls Who Invest (GWI) to address the gender imbalance in the male-dominated asset management sector. The women will spend the rest of the summer working paid internships at one of dozens of leading asset management firms, such as The Carlyle Group, Global Atlantic, AllianceBernstein and Farallon, that partner with Girls Who Invest. “We are trying to increase the number of women in asset management. And by asset management, I mean actually managing money — not investment banking, general finance or commercial banking,” said Janet Cowell, CEO of Girls Who Invest. In addition to gender diversity, Girls Who Invest promotes social, racial and ethnic diversity, Cowell said. About 20 percent of this year’s class are historically underrepresented minorities, she said. One quarter of the women come from economically disadvantaged backgrounds. “There is no cost to the program,” Cowell added, saying, “we don’t want (money) to be a barrier” to participation. Based in New York, Girls Who Invest seeks to inspire and support young women to become tomorrow’s leading investors through a summer intensive program for rising juniors and online learning programs for rising sophomores and rising juniors. 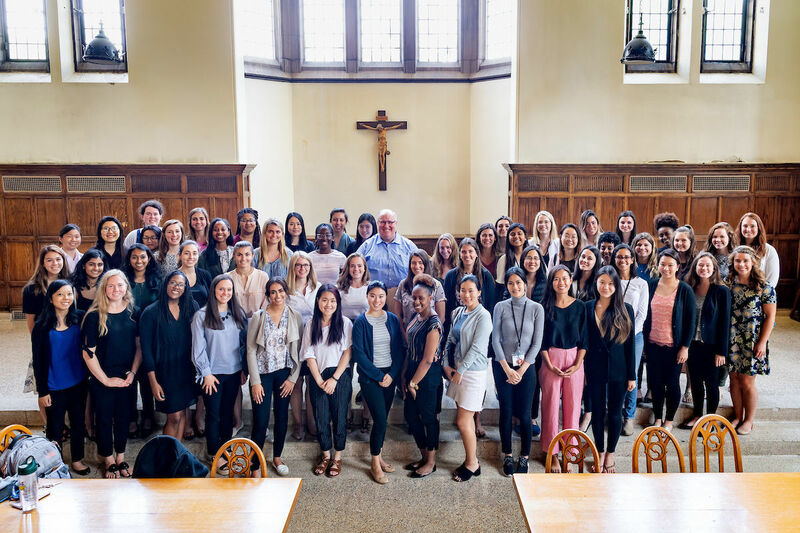 The summer intensive program, which combines four weeks of classroom work with six weeks of workplace experience, started with 30 women at the University of Pennsylvania in 2016. It expanded to 60 women at Penn in 2017 and 100 women this year — 50 at Penn and 50 at Notre Dame. The goal: Build a pipeline of female asset managers so that 30 percent of global investable capital is managed by women by 2030. A confluence of factors led to the partnership here, Cowell and Scott said. NDIGI was looking for ways to support its Women in Finance Initiative, which works to promote the advancement of women in the investment industry. GWI, meanwhile, wanted to reach more women across the United States. Currently, women and minorities manage just 1.1 percent of the U.S. asset management industry’s $71 trillion in assets, according to a 2017 study by Josh Lerner of Harvard Business School and Bella Research Group. This is despite ample evidence that diversity of thought in investment leads to better decision making and better returns — and despite serious and widespread efforts to cultivate and recruit more women from within the asset management industry itself. Unfortunately, the pipeline of young female investors is small — partly because women are less aware that a career in asset management can be meaningful and impactful, and partly because of lingering distrust around the industry from the 2008 financial crisis. At the same time, Cowell said, unlike young men, young women are often discouraged from studying math or other finance-related subjects. “I experienced this myself when I was in middle school. 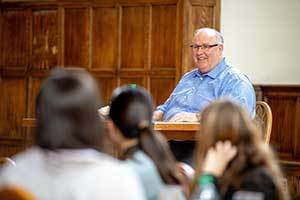 I had a math teacher who told all the girls that we had instinct as opposed to rationality,” said Cowell, a former state treasurer from North Carolina. A total of nine Notre Dame women were selected for this year’s program — five here and four at Penn. Two Notre Dame women were selected last year. The program is open to all rising juniors, regardless of major. For the women who participated here — including Amanda Wall (economics and finance) and Julia Reyes (economics and ACMS) — it was an opportunity to learn from faculty and industry professionals and network with other undergraduate women from across the country. At the same time, Reyes said, because there are mostly women in the room during the various classes and talks — and only women outside of the classroom, in the dorms — it allows for more candid conversations around the challenges women face in the typically gendered space of finance. The intensive nature of the program — a typical day for the women begins at 8 in the morning and ends at 8 at night — also helps prepare the women for the rigors of the job, which, for those who move directly from college into the job market, typically starts with a demanding stint on Wall Street. If so, consider this the starting line. For more information, visit www.girlswhoinvest.org. Nine Notre Dame women were selected to participate in this year’s Girls Who Invest Summer Intensive Program — five at the University of Notre Dame and four at the University of Pennsylvania. All are rising juniors. • Amanda Wall (finance and economics). • Emma Lowry (finance and applied and computational mathematics and statistics). • Clare Eilers (finance and psychology). • Julia Reyes (economics and applied and computational mathematics and statistics). • Kateri Budo (economics and math). • Maria Anthony (finance and Spanish). • Carson Collins (finance and history). • Melissa Guo (finance and political science). • Mary Lynch (finance and applied and computational mathematics and statistics). Originally published by Erin Blasko at news.nd.edu on July 17, 2018.